If a sweater was hanging in an empty forest, would it still be Cobalt Blue? I ponder these kinds of questions…maybe a little too much. Every time my wife suggests a hike, I can find some kind of excuse. And most of them are real concerns of mine. It’s not that I don’t like to hike in the glorious woods of the Adirondacks, but there’s often an honest reason to stay at home. I don’t “do” bugs. Black flies are a nightmare to be avoided. So, there goes May, June and most of July. The mosquitoes, of course, are around most of the time, except when it’s -36 F. (and even then they can find a way to my skin). The mud of spring is a no-go in most people’s book. That pretty much leaves some of September and early October. The leaves are in full color and the weather is cool and crisp, like a maple syrup crepe. But, a new challenge has come up. I was browsing through a few holiday catalogs and I found a reasonably priced ($39.99 + tax) pair of hiking pants from Cabelas. These Trailhiker II Pants had it all. I especially like the 9-oz 100% cotton-canvas basketweave fabric. Basketweave pants? Wait a minute. I’ve caned canoe seats before and that’s where I hear the term basketweave…but pants? I began to sense trouble in the road ahead. What happened to the old pair of jeans that had 4 pockets? As I was narrowing my search down, I was confronted with one last, but insurmountable problem. I remember when Lands End began to bring in strange color names. They were glorious names that evoked the seashore or the mountains of Maine. But they were still a bit strange. Then L.L. Bean jumped on the wagon and a whole new lexicon of hues and tints, dyes and washes made my pants search more and more difficult. Now I had to think about not what felt comfortable…but what was going to look good (color-wise) in the place where I was going to wear the new pants. I looked over the choices for the Trailhiker II pants. I could get them in British Tan, Otter, Gunmetal and Foliage. On the same page a Henley sweater was listed. The colors available: Nutmeg, Evergreen, Dark Midnight and Sandy River. I flipped the page. Another Henley sweater. Colors? Cobalt Blue, Sage, Cayenne, Antique Brass, Black and Brown. Brown? I was forgetting about Brown. I picked up a copy of the L.L. Bean holiday catalogue. I flipped through the pages checking out the colors from Freeport, Maine. A sampling: Weathered Leather, Saddle, Plum Wine, Heather, Dark Indigo, Charcoal Heather (maybe that was two colors), Collegiate Blue Camo, Mountain Red Buffalo, Deep Garnet, Glacier Blue (I’ve been on a glacier…it wasn’t this color), Cabernet, Dark Terracotta, Bright Mariner, French Blue (now we’re talkin’), Pink Lilac, Deep Mint, Crisp Lapis, Molten Red, Treeline, Warden’s Green, Moss Khaki, Alpine Gold and Dusty Olive. I was exhausted. Colors swam before my eyes like an Esther Williams water-color palette. I turned back to Cabelas for relief. After a few pages I found a pull-over in Medium Brown. Whew! Then I realized that Cabelas was mostly a hunter’s catalogue. You were not likely to find a Medium Brown pull-over in Miami. Thank God I couldn’t find my Lands End catalog. I might be in the early stages of sensory overload right now. I woke up screaming the next morning. I was soaked in sweat. The room was spinning like Linda Blair’s head. I had this unspeakably horrific nightmare last night. I dreamed that when I went for the mail, Mike, our local postmaster, told me that several dozen back issues of the J. Crew catalog were found in the back room of the post office. They all had my name on them! 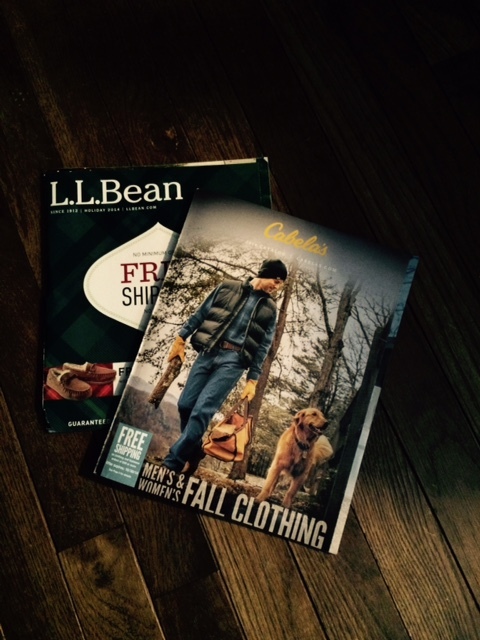 This entry was posted in Blogging, Everyday Events, humor, North Country Life, Real Personal History, satire and tagged Adirondacks, Cabelas, catalog colors, catalog shopping, hiking pants, J.Crew catalog, L.L.Bean. The solution is so obvious, it will induce beer-drinking: buy any color, get it really, really dirty, blend in perfectly with your surroundings. This is the knee-jerk solution for almost any dude from teenager on up; they practice on their underwear and socks until they’re indistinguishable from moss.